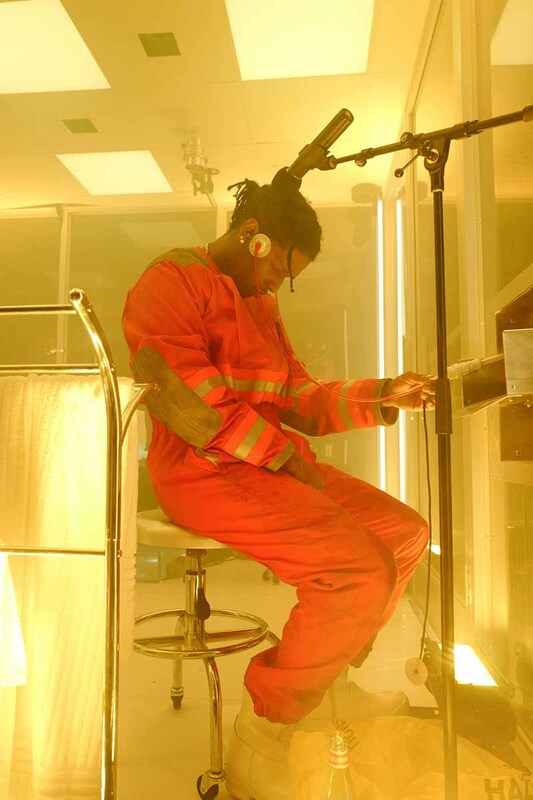 Calvin Klein 205W39NYC just added another notch on its street creds when rapper A$AP Rocky, for his live art performance, “Lab Rab” chose to wear togs designed by, Raf Simons, Calvin Klein’s Chief Creative Officer. A$AP Rocky wore a CALVIN KLEIN 205W39NYC black wool peak lapel tuxedo, and white poplin dress shirt to open the performance. He then transitioned into CALVIN KLEIN black tech shorts and ultimately, into a Fall 2018 CALVIN KLEIN 205W39NYC red distressed fireman jumpsuit with fireman calf ankle boots in white with rubber toe caps. As part on their ongoing partnership with Brooklyn’s Red Hook Labs Youth Community Program, CALVIN KLEIN – with the support of A$AP Rocky – invited two students, Genesis Gil and D’Andre Desir to document the performance. Their photography and videography will debut exclusively on @calvinklein social channels. Established in 2015 by Jimmy Moffat, a founding partner of creative agency Art + Commerce, Red Hook Labs was conceived as a platform to discover and champion emerging photographic talents. The partnership between CALVIN KLEIN and Red Hook Labs serves to provide students of the Youth Career Program with a first-hand understanding of, and exposure to the creative industry.